TS DIETCET - Online TS DEECET 2019 Notification for D.Ed Course Admissions / TS DEECET 2019 Notification for D.El.d Course Admissions, TS DIETCET 2019 Schedule: Government of Telangana State has given permission to the DSE Telangana to conduct the TS DEECET 2019 for the academic year 2019-2020. The School Education Department is going to release the Telangana DEECET 2019 in this month, 2019 and DSE Telangana would invite the online applications from the eligible candidates for admission into 2 (Two year) D.Ed(DEld) Courses and DPSE (Diploma in Pre School Education ) in District Institutes of Education and Training (DIET) and Private D.Ed Colleges through Common Entrance Test (DEECET) 2019. TS DEECET 2019 Online Application Form, How to Apply, #TSDEECET Website, Online Applying Procedure, Telangana D.Ed Colleges List, DEld Course Details, Entrance Exam Pattern, What is DEECET?, DEECET Means, Govt. 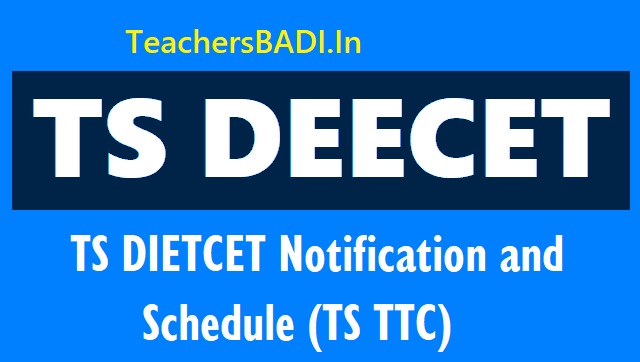 DIETS, TS-DEECET 2019 Schedule, Important dates, Telangana DEECET Web portal details are provided here. Online applications for appearing at the Telangana State Diploma in Elementary Education Common entrance Test (TSDEECET 2019) to be conducted by Dept. of School Education, Govt of Telangana shortly, are invited from eligible candidates who intend to take admission into two years Diploma in Elementary Education (D.EL.Ed) in Government District Institutes of Education & Training (DIETs) and Private Elementary Teacher Training Institutions in the state. DEECET Means Diploma in elementary education common entrance test/Elementary Teacher Training Institutes Common Entrance Test. D.Ed Course 2 Years: Candidates should remember that, from this academic year, as per NCTE norms DEd course duration is 2 year course. TS DEECET Seats: I think, in Telangana state nearly 14000 D.Ed seats are available. The candidates should have completed 17 years as on 01-09-2019. There is no upper age limit. 4. APOSS / TOSS inter Candidates are Eligible for DEECET 2019, but they should have 50% marks in Inter for OC and BCs and 45% marks in inter for SC, ST and PHC Candidates as per Govt. Orders. The fee prescribed for appearing for DEECET (including examination fee) is Rs. 350/-. Candidates can pay the fee through AP Online / e-Seva centers or through Payment Gateway and submit online application at the TS DEECET official website http://tsdeecet.cgg.gov.in as per deecet schedule. TSDEECET 2019 shall be conducted ‘ONLINE’. Detailed procedure shall be hosted on the TSDEECET website http://tsdeecet.cgg.gov.in/ shortly. DEECET will be conducted as per given schedule in all the Districts of the State. The test will be conducted on May 22 by Three sessions..
Education, Telangana State, Hyderabad:: The Candidates who are appearing for DEECET-2019 Online Test for admission into two year D.EI.Ed. course for the Batch of 2019-2020 are informed that the Online Test will be held on June .. in three sessions as follows. The Hall Tickets can be downloaded from the web site of tsdeecet.cgg.gov.in and Practice Test is also available for the students in the TSDEECET website. The details pertaining to the Structure and content of the test, Syllabus, Pass Criteria, Rule of Reservation and allotment of seat are given in the DEECET Information Bulletin will be released soon by the DSE officifals. Every candidate should read the deecet guidelines carefully for know more information. Candidates should qualify with 35 percent marks are eligible for attending web counselling. Sir, i got 46 marks in tsdeecet.but I don't know what is my rank. Sir naaku govt diet college lo seat vastundha.i'm belongs to bc - d.any extra.qualifications levu .tsdeecet rank cards yeppudu declare chestaru.sir rply pls. Meeku private vache avakasam undochu..
hello sir!!! dietcet results are released but what about rank cards.....when the govt will release the ranks....when do we have councelling ...? Sir naaku 43 marks vachai (oc) naaku seat vastunda. and tarvaatta unde process gurinchi cheppandi sir. Sir,deecet main page lo first verification of certificates ani vundhi.next rank cards declare chestaranta and councelling dates announce chestaranta. certificates verification ye type lo vuntundhi.rank card announce cheyakunda certificate verification yenti.yekkada verification chestaru, yeppudu verification start chestaru.ppplllzzz rply sir i am confused ppplllzzz sir. Sir 43 marks oc seat vastunda. Sir , certificates verification yeppati nunchi.yekkada verification chestaru sir.plz rply plz. Sir, certificates verification yeppati nunchi. Verification yekkada chestaru.reply evvandi sir please please.i'm requesting u sir. Sir, certificates verification yeppati nunchi start chestaru. Yekkada verification chestaru. Rply evvandi sir.please reply.tension ekkuva avuthundhi sir.plz rply sir. Sir Naa peru Prasad . Naku Dietset 2015 loo 35 Marks vachayi sir. Nenu Bc - A sir. Sir Naa Peru P,Prasad .Deecet loo 35 Marks vachayi , nenu BC-A . Naku seat vastunda. Hello sir !!! Plz can you Tell the dates for certificates verification ... where do we have this verification at college centres or at online centres ??? Plz reply sir.sir maa comments ki answer rply evvandi.i'm requesting u sir. Hi sir my name prasad. Naku 35 Marks vachayi nenu Bc-A sir. Sir, certificates verification ki naa daggara study certificates 3 to 10 class varake vunnayi.1-2 classes study certificates levu.because nenu 1-2 classes nizamabad lo private school lo chadivanu.now that school is closed.present maadi medak district. eppudu cheppandi 1-2 classes study certificates leka pothe amavuthundhi sir.please reply sir.please please please please please please please please please please please please sir. Sir I got 40 marks (st) am I eligible in govt diet clg. i got 46 marks in dietcet.can i get govt seat..
can we take CUSTODIAN CERTIFICATE at verification of certificates for only t.c. Certificate verification ki transefer certificate (t.c) avasaramaa sir.please reply. When you admit to the D.Ed College, TS is Compulsory..
super job ...sir in the analysis the no is correct or wrong???? Ma sister ki 36 marks vachayi. SC woman quota lo Govt Diet lo seat vache chance vundatara? Sir, certificate verification ki naa daggara bona fides 1-10 varaku levu sir.3-10 varaku maatrame vunnayi.aithe 3-10 varake vunte emavuthundhi sir. YOu will GeT a DEd seat in Private College................Same Marks Vunte DEECET loni Subjects Nu Choostaaru...Avi Kooda Same Unte Evariki age ekkuva Vunte Vaaru Mundu Untaaru..
sir na name sudheer (AP) na cast (sc)sir naaku diet lo 42 marks vachay naaku seat vasthumdaaa?? Qualifying Marks Thagge Avakaasam Undi....Please Wait for few days..
Sir naku 40 marks vachayi bc-d and pH(oh) naku seat vastunda? Vaste govt seat vastunda Leda private vastuna? Praivate fees entha untundi? fee anedi Govt Decide Chesthundi..
Meeku Admission Letter lo Fee Details Vuntayee.. Previous year lo 13,000/- fee first year ki undi..
sir all colleges ki affiliations vachaya sir. telangana lo enni deecet seats unnayi sir. >> Tharvatha Online lo Web Options isthaaru..
sir naku dee cet lo 46 marks vachaayi, naa cast ST, sir naku seat vasthundhaa? sir nenu apdeecet rasanu 42marks bc-b naku seat vastundaa? convinor kotaa ante emiti theliyajeyandi. Sorry! You are not qualified. All the best for next time. Another way, Try for management quota in any private d.ed college. sir naku apdeecet lo 42marks bc-b naku seat vastundaa? convinor cotaa ante emiti fee pay cheyaalaa? Sir in Ap deecet qualify marks. For sc, st 45, and for oc, bc 50. Above not qualified. sir naku deecet lo 46 marks vachaayi maa cast ST naku govt clg lo seat vasthundha? sir naku deecet lo 46 marks vachaayi maa cast ST, nenu present degree second year chesthunna sir, naku ttc lo seat vasthey ttc chesukuntu open degree cheddhamanukuntunna sir! D.Ed Chesthu..Open Degree Cheyochchu... But You Should Concentrate on your D.Ed Course..
Srikanth gaaru...2 or 3 days lopu Rank Cards Release chestharu..
sir i got 45 marks ...bc- d.
Sir, ts deecet 2015 lo naaku 46 marks vachayi.naaku seat vastundha.i'm belongs to bc -d.
but tomorrow is a holiday.....then when sir.? Sir Naa Peru P.Prasad Deecet lo 35 Marks Vachayi sir . Bc A caste Sir Seat Vastunda sir. My name is P.Prasad deecet lo 35 Marks Caste Bc A Seat Vastunda sir. Sir,ts deecet 2015 rank cards declare yeppudu chestaru.reply please sir. Sir ,Deecet rank cards nu eppudu declare chestaru. Sir, deecet rankcards eepudu declare chestaru. Date cheppandi sir, Plz replay sir. Sir My Name is P.Prasad Deecet lo 35Marks vachhayi sir Bc A Caste sir Seat vastunda sir. Hello sir Good morning. And Happy vinayaka chaviti sir. Na peru Aruna naku ttc lo 37 marks vachayi (ST) mari naku govt clglo seat vastunda sir. Inka rank cards gurinchi apudu announce chestaru sir chepandi please..
Meeku Govt lo Vasthundi.. Miss aithe Privatelo Sure..
Thats not correct ranks allotment is big process. Rank Cards release cheyadaaniki 2 / 3 days paduthundi..
Sir my name ravi naku 45 marks vachay bc-d caste naku seat vastunda??? plz reply sir..
Sir naku tsdeecet lo 40 marks vachayi BC-D and PH(OH) seat vastada? govt seat cache avakasam unda? Sir My Name P.Prasad Deecet lo 35 Marks vachhayi Bc A caste sir seat Vastundaa . Sir Naa Peru P.Prasad Deecet lo 35 Marks vacchayi sir ''Bc A'' Caste sir Seat Vastundaa sir. Naaku 43marks vachai, oc seat vastunda sir.please Cheppandi. Sir Naa Peru P.Prasad 35 Marks vachhayi ( Bc A) Seat Vastunda sir. Sir Please sir Replay ivvandi. Hi Sir Naa Peru P.Prasad Deecet lo 35 Marks Unnayi BC A Caste sir Seat Vastunda sir. Please sir Dayachesi Replay Ivvandi sir . hi sir na peru pavan cast sc naku ts deecet lo 35 marks vachay private clge lo naina seat vasthundha reply plz.....? hii sir ! nenu present degree second year chesthunna, present degree scholarships online date ichesharu, october 30 last date sir, Ippudu nenu degree lo online chesukuntey, nenu ttc chesthunnappudu vaallaki emaina fee kattalaa? Sir, ts deecet 2015 rank cards declare yeppudu chestaru.reply please. Hii sir my name is Lokesh naaku 45 marks bc-d caste naaku govt diet clg lo seat vastunda plzzz reply sir.. PLEASE TELL ME SIR, I GOT 35 MARKS IN 2015 DEECET CASTE IS BCA SEAT VASTUNDA SIR. Eppudu release chestaru sir ranks..
hi sir tsdeecet loo 42 marks naku seat vastunda.(bc-a). Sir, nenu 1st certificate verification ki attend ayyanu.kaani 1 - 2 classes bona fides submit cheyaledhu.due ani raasaaru.2nd time certificate verification ki attend kaavacha.please reply sir. hi sir naku tsdeecet 42 marks vachai. Sir Malli Verification aa sir........!